The Spray Polyurethane Foam (SPF) insulation industry is in a constant state of change and innovation. As such, the Intech Equipment & Supply support team strives to provide our customers and readers with a comprehensive collection of regularly updated, educational information about everything related to polyurethane spray foam equipment. For those SPF contractors new to the industry, we highlight a “Quick Start Guide to Polyurethane Spray Foam Equipment” in this blog post. A professional contractor applies SPF insulation using commercially-available, high-pressure, plural-component proportioning technology. In other scenarios, you can apply polyurethane spray foam using low-pressure, two-component pressurized kits, or single-component cans, commonly used in smaller-scale applications. The type and quality of the polyurethane spray foam equipment you use are integral to the process of applied spray foam, including transferring the components out of the 55-gallon material drums, heating and pressurizing the materials, pumping said materials through hoses, and mixing and spraying the components. These all-in-one mobile packages combine everything a contractor needs, including tools and equipment, for SPF application. Contractors appreciate having all of their necessary polyurethane spray foam equipment, such as air and power utilities, as well as spare parts, in one, convenient place. Mobile SPF rigs help contractors arrive on a job site ready to work. Rigs help eliminate lost time running around searching for power. They also allow contractors to keep valuable tools and supplies in one safe place. 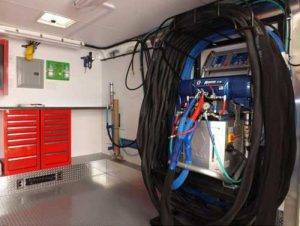 Because downtime can be a certain aspect of SPF applications, many of today’s mobile spray rigs feature workbenches, generators, and tools that allow contractors to service equipment on an as-needed basis. Often called spray foam machines, proportioners are intricate pieces of machinery. They require a specific knowledge to operate and maintain, as well as to purchase. Pump Drive System. The pump drive system is what makes the metering pumps go up and down, or back and forth. The metering pumps proportion the materials and transport them out of the machine through the heated hoses, to the spray foam gun. Most drive systems are electrical, hydraulic, or pneumatic. Many of today’s contractors consider hydraulic as the highest-performing of the three machines, while electric and pneumatic are commonly more affordable, yet deliver both performance and value. Pressure Rating. The proportioner’s pressure rating is a measurement of how much pressure the equipment will generate to mix the chemicals at the spray gun; this is quantified in pounds per square inch (psi.). Heating Capacity. Most SPF insulation is typically processed between 140°F-150°F. This temperature range helps with regards to the thickness of the liquid chemical components to help in pumping and mixing. The temperature of the material does impact spray pattern as well as the physical properties of the end product, so it is essential to make sure the proportioner’s heating system is in good shape. Electrical System. The majority of these machines have control systems and heaters that require an electrical connection. SPF guns perform the most vital functions of the SPF application process: mixing the chemicals and spraying it to the target substrate. Many of the spray foam guns available today utilize special mixing technology to combine the substances inside the gun. When a user pulls the trigger, equal amounts of the two chemical components enter the mixing chamber where they start to react. As the fluid is under pressure, this mixture forces its way out of the chamber through a small opening, and, as a result, atomizes into a spray form upon exiting the spray gun. If you have additional questions about these pieces or the various types of polyurethane spray foam equipment we offer at Intech Equipment & Supply, including top-selling equipment from Graco and PMC, contact us to speak with one of our team members today.